Microsoft Windows XP comes with Windows Messenger version 4. Already obsolete, this version of Windows Messenger will have to be updated with the just released Windows Messenger 4.5. Users will be able to update through the Windows Update website, through a popup of Windows Messenger or via the MSN Messenger website. The latest incarnation of the 'ICQ Killer', MSN Messenger 4.5 has been renamed to Windows Messenger since it is tightly integrated with the operating system for the first time. 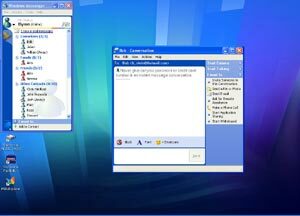 Windows Messenger lets you view buddies that are online and chat with them live: the main advantage over the asynchronous email communication method is that you get an instant reply. Windows Messenger 4.5 has been totally redesigned to meet Windows XP’s overall new look. The Windows Messenger main window now displays tabs on the left side that contain shortcuts to access Microsoft .NET services. You can check the appointments you have scheduled, scrutinize the evolution of your stocks through MSN Money and much more directly from Windows Messenger without opening Internet Explorer. That’s awesome in keeping an eye on vital information. If you ever receive e-mail in your Hotmail inbox while being connected Windows Messenger will notify you so you can quickly check out those incoming e-mails. The bottom part of the window displays an expandable task pane where you can access the most current features through links like ‘Add a contact’, ‘Send a File’, ‘Make a phone call’, ‘Start a chat’, etc. A long reclaimed feature was the ability to sort contacts by groups just like in ICQ or AIM. Windows Messenger now supports the creation of contact groups: so you can move your friends into the buddies group, add co-workers into the work group, etc.. The message window has also been partly redesigned. The right part of the messaging window now shows a lateral pane where you can access the most current features to start your camera, start talking, send files, photo or email, make a phone call, ask for remote assistance, invite someone to the current conversation, and start application sharing or whiteboard. In addition the right pane is the place where you’ll watch the video coming from your buddy and also where you set the volume level. It’s possible to chat with several contacts at one glance. Plus the typing indicator lets you know when your contact is typing a response so you don’t wait for hours when he or she is away. Plus you can start online games directly from Windows Messenger by inviting your friends to participate in a game hosted by your PC. One of the major new enhancements of Windows Messenger is the integration of the Windows NetMeeting features. Not only you can type text on your keyboard to communicate with your pals but you can also view them, send video of yourself through a webcam and speak or listen to them! 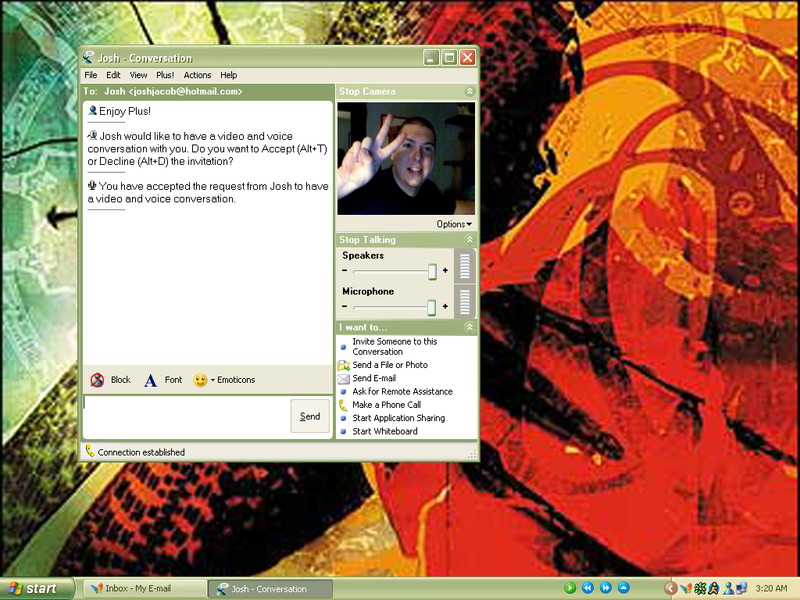 Windows Messenger indeed opens a new era for instant messaging since you can view mates that are online, speak with them naturally or view them while they’re viewing and listening to you through a simple webcam. Thankfully this new way to communicate is very easy to use. However clearly it requires several UDP ports to be opened and that’s a problem for those of you who are working in a corporate environment since most firewalls will likely block the UDP ports Windows Messenger needs for the audio and video streams. Another new feature is the ability to send international calls from your PC to a regular phone using Windows Messenger in order to save phone bills. You can decide which phone service provider works best for you from a list of providers. Windows Messenger features brand new splendid icons to express your emotions. Instead of typing weird and meaningless shortcuts to display emoticons you can now access the most used ones from the toolbar of the typing message window. This toolbar also offers two buttons to change fonts or block a contact. Many new emoticons have been added (including undocumented ones) so you can at last cry during a Windows Messenger chat. Strangely Windows Messenger doesn’t let you send messages to pager or mobile phones anymore while previous versions included this great feature. A small but useful improvement to the Windows Messenger is that you can send files to an online contact with a simple drag and drop of the files in the messaging window. A clear drawback and step back of this new release is that you can’t access anymore the list of connected buddies from the tray icon of Windows Messenger. Also despite what has been announced by Microsoft, Windows Messenger 4.5 final (build 4.5.0120) doesn’t let you add contacts that are connected to an Exchange IM server. Windows Messenger partially replaces Windows NetMeeting. 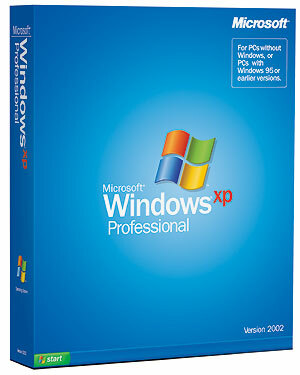 The result is that Windows XP doesn’t contain any shortcut in the start menu (or everywhere else) to launch Windows NetMeeting despite the fact the software is installed by default on the computer. Users that want to use NetMeeting will have to find the program by themselves on the computer. You’ll notice the version of Windows NetMeeting bundled with Windows XP is quite outdated since its one year. 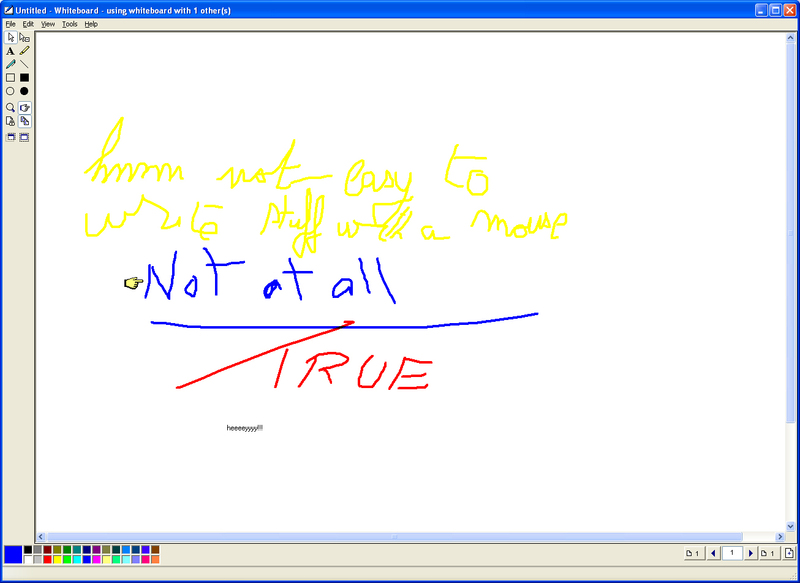 Windows Messenger just like NetMeeting lets you start whiteboard sessions and share currently running applications.